First time in Krakow? Then our gay Krakow city guide is for you. Poland’s second city and home to over 750,000 people. 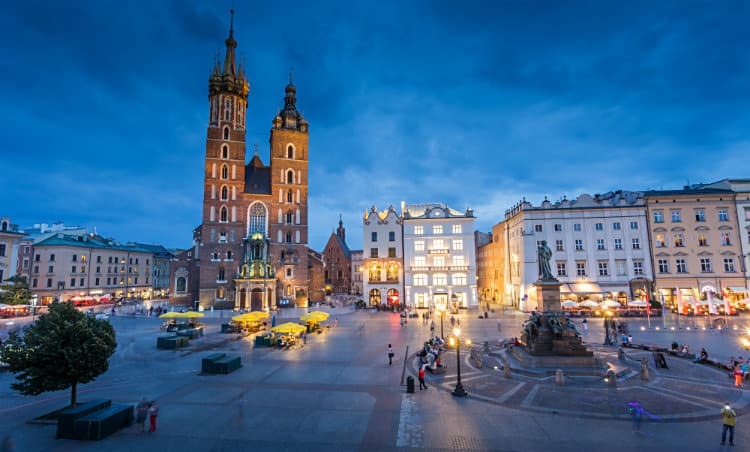 Krakow mixes medieval splendour, 20th Century glamour, and postwar Soviet architecture to create a spectacle that you won’t forget in a hurry. The medieval city centre hosts one of the largest town squares of its kind in Europe. Other than this, people are drawn to Krakow for it’s elegant cafe culture, breathtaking views, and modest gay scene. For gay rights in Poland, please see our Gay Warsaw City Guide page. As you may expect from cities in Eastern Europe, the gay scene is not as in your face and pounding as cities in neighbouring Germany. That being said, Krakow has a low key but growing gay scene. 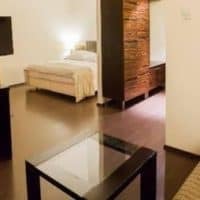 Concentrated mostly in the trendy Kazimier district (old Jewish quarter), you will find a selection of Gay Bars & Dance Clubs and Gay Cruise Clubs within walking distance of each other. Krakow does not have a Pride festival as such but has a smaller annual queer celebration. 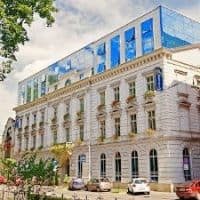 In comparison to Warsaw, conservative attitudes are a little bit more prevalent here and previous attempts at hosting pride ceremonies have been met with protests. Saint John Paul II International Airport Kraków–Balice (KRK) is Poland’s second largest airport. It is well served by the major European airlines as well as the budget airlines with Polish national carrier LOT offering transatlantic flights. There is a modern train service from the passenger terminal to Krakow central station with wi-fi, air conditioning and charging terminals. Singles cost PLN 9 and journey times are around 17 minutes. Trains run from around 5am until just after midnight. Bus lines 208, 252 and night bus 902 run from the airport to the city centre. Tickets cost PLN 4 for a single with services running at least every 20 minutes (less frequent depending on the time of day. Krakow Airport Taxi is the only official taxi company operating at the airport. You can pre-book in advance and journeys cost around PLN 89. As with much of mainland Europe, there are good connections to other European cities via rail. Kraków Główny railway station has services to Vienna, Prague, Bratislava and Budapest provided by Polish national rail carrier PKP. Krak0w is relatively compact with the majority of the main sites situated in close proximity to each other. It’s also the perfect way to take in the beautiful architecture and winding medieval backstreets as the historic centre has essentially been pedestrianized. If you need to rest your legs, Krakow has an efficient and well-connected integrated public transport system. Buses and trams run regularly from 5am to 11pm with night bus services running less frequently. Prices start from 2.80zł for a 20 minute journey (approximately 8 stops depending on traffic). Day tickets start from 15zł and you can buy passes for multiple days. Tickets can be bough either at the stop or on the vehicle but do remember to validate your ticket. 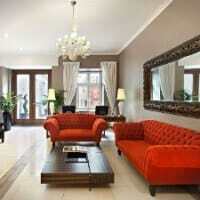 Krakow has an excellent choice of hotels to suit all budgets. 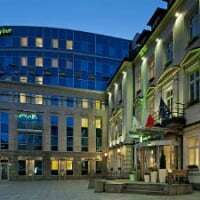 Check our list of top Krakow Hotels for gay travellers. Main Market Square – the heart of Krakow’s old town. This is the focal point of Krakow’s nightlife and café culture with a plethora of bars and restaurants located here to people watch and admire the beautiful medieval architecture. Wawel Royal Castle – imposing structure built on a hill built in a variety of architectural styles. Legend has it a dragon once lived in the hill before it was slain by prince Krakus. Jewish District (Kasimierz) – hip and trendy district that features the majority of Krakow’s gay venues. Expect an alternative crowd and a distinctive selection of galleries and vintage stores. Schindler’s Factory – it’s impossible to visit Krakow and not be confronted by its turbulent 20th Century history. Here you can find out more about the Jews who were saved from the death camps by industrialist Oskar Schindler, as immortalised in the film Schindler’s List. Church of St. Peter and St. Paul – Polish Baroque church famous for its statues of Jesuit saints on its facade. St Mary’s Basilica – brick gothic church famous for its wooden altarpiece. On the hour a trumpeter plays the Hejnał Mariacki, a five note anthem that is iconic of the city of Krakow. Auschwitz – infamous Nazi death camp. There are many tours advertised but you can arrange your own trip if you wish. A bus or train from Krakow to the nearby town of Oświęcim. You will have to pay for a guide earlier on the day but if you go later you can explore at your own pace. Wieliczka Salt Mines – a short train journey outside of Krakow, these ex-salt mines are an impressive feat of architecture. While the tourist route only shows you 2% of the mine’s true extent you will encounter an underground lake and a cathedral constructed out of salt. Weather-wise, Krakow is at it’s best in July and August, however that is when the tourists descend on the town. We would recommend visiting in May or June as the weather is fresh and the plants are still in full-bloom. Winters are bitterly cold, as in much of central Europe; however, the snow adds a certain magic to Krakow’s beautiful architecture. Poland is within the European Schengen visa area. If you’re travelling from outside Europe, check to see if you require a Schengen visa. Poland is not part of the Eurozone. The Polish currency is the złoty. ATM’s (bankomat) are easily found all around Krakow. Visa, MasterCard, Visa Electron and Maestro are widely accepted; AmEx and Diners Club less so.